After you are greeted by your English speaking driver, you will make your way to the historical center passing the National Monument of Vittorio Emanuele II in Piazza Venezia to the splendorous of Ancient Rome. Your driver will take you on top to the Capitoline hill for you to start with a view of the Roman Forum, a great stop for a memorial picture, then a drive to the Coliseum, the largest Amphitheater ever known in the ancient world, your driver will give you explanations on it before you enter and explore it yourself. From here, you will continue on passing the Palatine hill and the the Circus Maxims and of course with a stop at the glorious Pantheon, built in the 1st century, a fantastic architectural inspiration to artist from the renaissance period to the modern times. You will of course have time to explore the main squares of the city as we, such as Piazza Navona, Spanish steps and not to mention the Trevi fountain. This private tour is for you to see some of the highlights of the Vatican museum, the important ancient statues that give life to Renaissance, you will walk through the three main galleries of museum to see the famous tapestries and map room before entering The Sistine Chapel that is the highlight of the tour, where your private guide will explain in detail the work and study of the master Michelangelo for create this magnificent ceiling. The tour ends with St Peter’s Basilica where you will explore the glorious baroque art and Michelangelo’s Pietà and end in St Peter’s Square for the last of many picture moments. The guide will meet you across the entrance to the Vatican museums, in front of Cafe Vaticano (Address: Viale Vaticano), holding a sign with your name on it. Your English speaking driver will meet you in the morning at your hotel and you will start with a little drive outside the city to find one of the oldest sites in the city – the Appian Way. You will stroll on the peaceful road on some of the original paving stones. Next is a visit the Catacombs,a maze of underground Christian cemeteries dating to the 1st century, this is a unique experience to walk the eerie tunnels full with empty tomb niches and beautiful frescoes. Your next stop is the Park of the Aqueducts to see just one of the massive and well-constructed ancient aqueduct, carrying tons of water into to the city for centuries, after you have time to walk aside, a chance that not many visitors get to have, your driver will take you back to the city center. Passing the magnificent Baths of Caracalla, a 3rd century bath that could hold more then 1500 people at a time going on the Aventine hill, one of the seven hills of Rome to see one of the secrets of Rome (not the best kept secret :), the keyhole. From here you will continue on to the other side of the Tiber review to historical and electric, the most bohemian part of the city, as they say “where the true Romans live”. Here you will visit the main square and one of the oldest and most beautiful medieval churches in the Rome, Santa Maria in Trastevere. Great time in Rome only because of Rome in Limo.Thank you Jany, for all your guidance and good itinerary support.We visited Rome in middle of February with no hassles. Our driver, Henrico is very knowledgeable, informative and very patient.We enjoyed our whole trip thoroughly in a private vehicle with leisure stops. 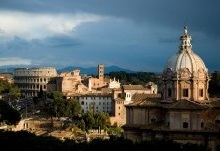 I definitely recommend Rome in Limo to anybody who is opting for private guided tours.